It"s simply was not enough making life size cupcakes, I had to make a guest size version. Don't want anyone to feel left out. They are around 45gms. Equally as adorable and so much fun to make. Love, love cupcakes, big or small. 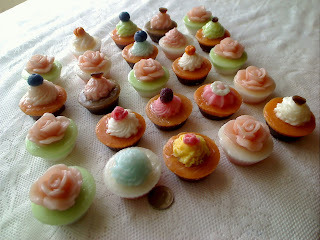 Now in the mist of making these mini cupcakes soap, I suddenly realised that they were getting bigger with each batch. 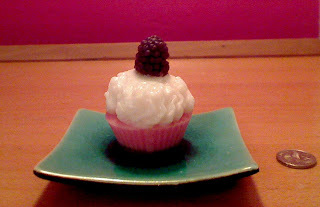 This cupcake (photographed on its own) topped the batch, reaching 75gms in weight. The weight and size definitely falls into the "grey area" of classifying it as a guest soap or a normal size soap. If anyone is interest in the extra large mini cupcakes, please let me know.